Ira Cohen’s Invasion of Thunderbolt Pagoda. Resounder: What we’re listening to and why. Some would say that the spir­it of the psy­che­del­ic 60’s is dead. Per­haps, but there will always be this ves­sel for it to live on. For those unaware, Inva­sion of Thun­der­bolt Pago­da has once again been re-released, this time by Arthur Magazine’s DVD imprint, Sat­ur­na­lia. Inva­sion of Thun­der­bolt Pago­da is Ira Cohen’s 1968 Mylar Mas­ter­piece, and is hailed as the only true psy­che­del­ic film. About a month back I was lucky enough to attend the DVD release par­ty for this film, and see Mr. Cohen do a read­ing of some of his poet­ry, as well as the band Brain Dam­age play a live score to a piece one of the mem­bers had done using for­got­ten mylar film from Cohen’s archives. To top it off, Sun­burned Hand of the Man played live over the film, doing their ver­sion of the sound­track. This film stands the test of the time like no oth­er, sim­ply because there will nev­er be a sin­gle thing like it. Pos­si­bly the most inter­est­ing part is the soundtrack(s), as there is no actu­al dia­logue and the way in which they com­pli­ment the film is stun­ning. This par­tic­u­lar release of the film comes with 3 sound­tracks. 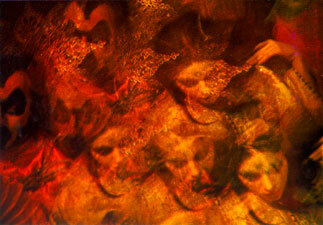 The orig­i­nal Angus MacLise score, joy­ous lake, one by Acid Moth­ers Tem­ple and anoth­er by Sun­burned Hand of the Man. It also includes the extras done by Brain Dam­age. Although at 30$ it is some­what pricey, it’s an absolute neces­si­ty for all lovers of psy­che­del­ic art and expres­sion. You can pur­chase it from the Arthur mag­a­zine web­site.